The Good Place was just renewed by NBC for a fourth season and I couldn’t be happier. The show is smart, tackles philosophy and the concept of goodness in a way that makes me laugh every week, has a podcast that is just as entertaining as the show itself, and is exactly the right length for what it’s doing. Ten episodes a season seems so short when you get to the end, but think about it. It’s exactly the right amount for you to want to come back, and to keep it from being just a little too much thinking. The other thing the show does so well is highlight female friendships. Well, friendships of all kind, but that isn’t new. We’ve seen wonderful friendships between guys before, and certainly between men and women, but female friendships are so often relegated to snippy comments or boyfriend/husband fights. There are a few shows out there that do it well, like Riverdale keeping Betty and Veronica from the cat fights and instead having them as besties. There just aren’t very many. 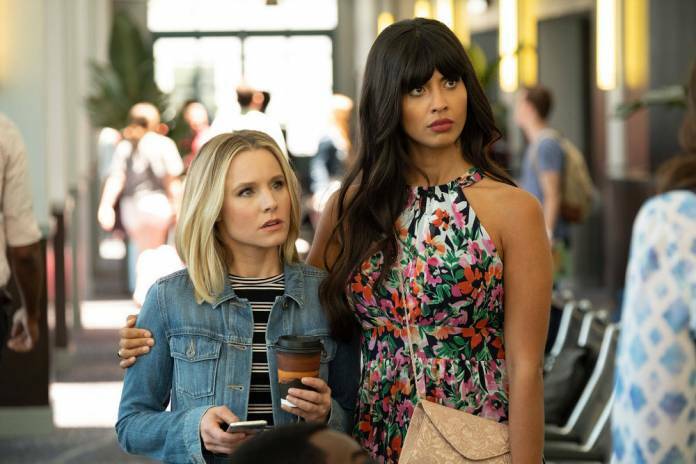 In the show, we’ve seen a beautiful change in Eleanor (Kristen Bell) and Tahani’s (Jameela Jamil) relationship. Where it was once (and there are spoilers on the way, so be warned) fraught with frustration and misunderstanding, it’s now accepting and lovely. Eleanor always gets the name dropping, as she tells Tahani, but understands who this woman is, and cares about her despite her flaws. Tahani is supportive of Eleanor’s wonky personality with no real judgement. Perhaps we can assume that, despite the fact that the Soul Squad doesn’t remember the things that happened to them in the endless reboots of their afterlives, some of the work they’ve done on themselves has rubbed off. Even when Simone (Kirby Howell-Baptiste) comes into the picture as a love interest for Chidi (William Jackson Harper), Eleanor is encouraging. Unlike other shows, she’s not immediately comparing herself to Simone and attacking the new girl for her own insecurities. She helps facilitate the relationship between Chidi and Simone. Sure, she didn’t remember her connection to Chidi then, but there was something there. Still, she didn’t jump to the usual trope of girls vs. girls. When they have an issue, it’s not about a man. (Yes, the show passes the Bechdel Test with flying colors.) Their conversation is about Eleanor’s failure to develop her friendships past her selfishness. Here we see Simone being kind to someone who has just yelled at her to help her grow as a person. When was the last time we didn’t see women pitted against each other over a man? Finally we have Janet. Yes, Janet is glorious and not human and has all the knowledge of the universe (at least through the last time she stuck her head through the door to the afterlife), but she’s more human than she thinks. Janet is in love with Jason, and when she tries to remain calm, she doesn’t do so well, but it’s not her driving force in life. She’s trying to help these people she cares about so much find a way to be accepted into the Good Place. She’s there to help them, despite being a computer. She’s that weird buddy we all know who just doesn’t live in the same world we do, but whom we love despite that, because they are unfailingly kind. Programming or not, she’s always got the right advice, and cares about her “family,” no matter what romantic disappointments are in her way. In a strange way, it feels almost too simplistic to break it all down in this way. The complexities of the women in this show and the way they relate to each other feel far more real than anything we usually see, because they are real. (Hey, they have women in the writers room, which helps. Shocking, I know.) They’re beautiful and they reflect what our friendships are very often like. Congratulations on the renewal, The Good Place. We’re so forking happy that you’ll be back!